Hydraulic sausage stuffers are a consistent and dependable way to stuff large amounts of sausage casings, without having to spend time with a manual stuffer! These high-pressure commercial sausage stuffers are suitable for dense and cold mixtures. 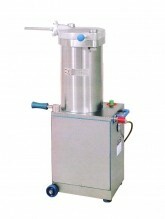 Talsa Hydraulic Sausage Stuffer’s available from 15L to 52L, for whichever size fits your establishment’s needs!